Vltava (Die Moldau) is the second of a set of six symphonic poems collectively known as Má Vlast (My Country) written by Czech composer Bedřich Smetana (1824-1884). Composed between 1874 and 1879, Smetana depicts aspect of the countryside, history, or legends of Bohemia in his native Czech land. The second of the six, Vltava, depicts the longest river within the Czech land. Traveling with his musician friend Mořic Anger to the western edge of Bohemia, near its border with Germany, Smetana saw the river up close and personal. He was awed not only by the beauty of the river, but also how the river was an integral method not just for travel, but entertainment. So moved from what he saw, in a span of nineteen days (as noted in his diary), Smetana composed this tone poem to musically portray the river. 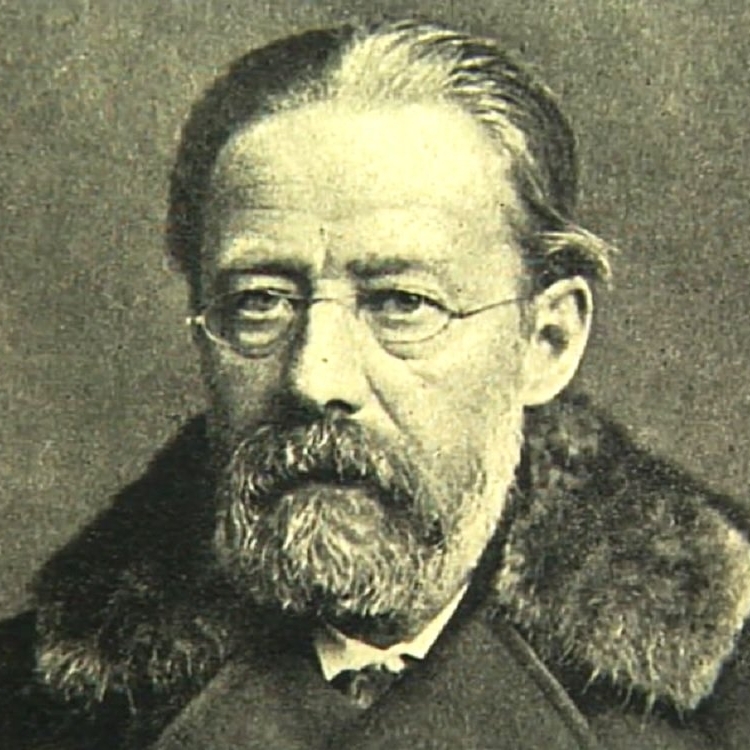 Smetana penned brief commentaries to explain the specific content of the tone poem. The points of his description are reinforced by still shorter “chapter headings” in the score. He begins: “The composition depicts the course of the river, from its beginning where two brooks, one cold, the other warm, join a stream.” The two flutes introduce an ascending motif, interweaving as they bubble up, accompanied by plucked violins and harp. The clarinets add their voices, but descending, rather in mirror image to the flutes, thus expressing the opposites of the cold brook and the warm one. Finally, violins, oboes, and bassoons sing out the broad “Vltava” theme itself, surging majestically. It sounds quite like a folk tune, and indeed Czech words from another folk song were later grafted on to make it, effectively, a “new” folk song in its own right. Smetana continues that the two brooks “join a stream, running through forests and meadows and a lovely countryside where merry feasts are celebrated.” The horns issue a hunting call and are joined by the plangent oboes and bassoons in an arpeggiated tune to launch the peasant gaiety. The notation in the score adds that the river passes by a rustic village wedding; the whole orchestra joins in a polka, the sounds of which eventually recede into the distance. “Water-sprites dance in the moonlight; on nearby rocks can be seen the outline of ruined castles, proudly soaring into the sky.” We have penetrated deep into the world of Romanticism. Again, flutes and clarinets play leap-frog (ondeggiate—“wavelike”—advises the score) in rhythms that don’t quite correspond; the flutes divide their beats into four notes each, the clarinets into three. “Vltava swirls through the Saint John Rapids and flows in a broad stream toward Prague.” There, indeed, is the Moldau theme resurgent (in the violins and oboes at first and eventually the whole orchestra), spiky as it crashes through the rapids and finally achieving grand magnificence. “It passes the Vyšehrad” – the promontory castle on the city’s outskirts, a site of historical importance to the Czechs – and disappears majestically into the distance, where it joins the Elbe.” The texture thins, eventually diminishing to just the violins, rising in an arpeggio, smorzando (“dying away”) – and, with two fortissimo chords from the full orchestra, we have reached our terminus.